Everett’s mix of highway trestles, limited corridors and job growth mean drivers lose more time every year to traffic jams. Usually, a world-class city like Los Angeles, New York, or Washington, D.C., springs to mind when people think of debilitating traffic. But this year’s INRIX Global Traffic Scorecard, released Monday night, spreads its infamy to a small Northwest city. 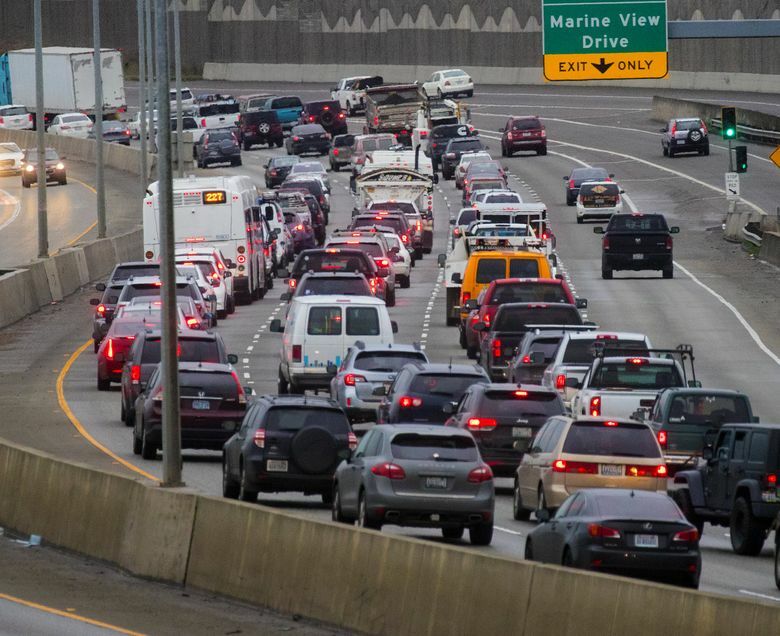 “Commuters around Everett, Washington, spent more time stuck in traffic than anyone else,” according to commentary by the Kirkland-based transportation data and navigation company. The 10 major cities where drivers in 2017 faced the most hours of peak-time delay, compared to free-flowing traffic. That verdict is based on the proportion of peak commuting time wasted in stop-and-go traffic, entering and leaving the city of 110,000 population north of Seattle. INRIX’s report meshes with other measures. Washington State Department of Transportation (WSDOT) data say I-5 morning drivers from Everett to Seattle needed 94 minutes to reliably make the 24-mile trip on time, as of 2016. That worsened from 85 minutes in 2014, and 76 minutes in 2012. 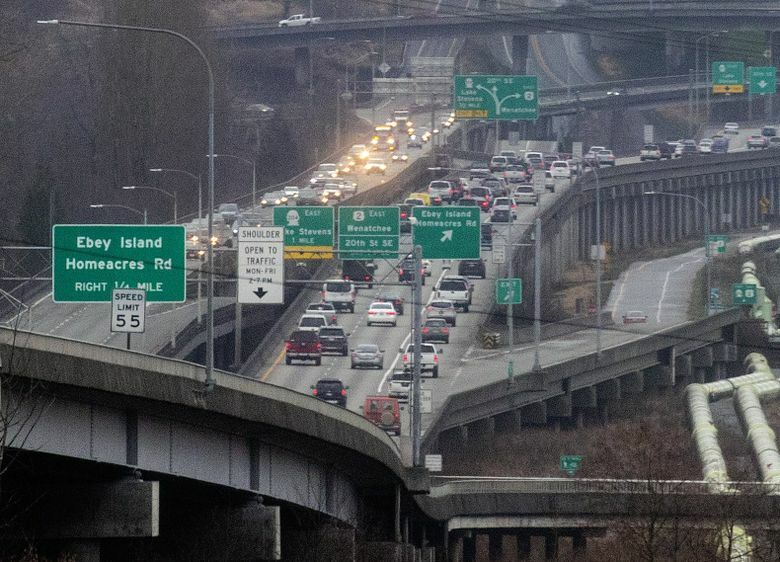 The WSDOT figures don’t include minutes on the tight, aging Highway 2 trestle from Lake Stevens and Snohomish, or the crowded cross streets such as 128th Street Southwest to homes in the Mariner, McCollum Park and Silver Firs areas. In addition, the Greater Seattle region, from Lynnwood to Kent, ascended from 10th to ninth-most-congested among large cities, with an average 55 hours a year spent in delays. Portland ranked 13th with 50 hours delay, and Tacoma was 18th at 41 hours delay. Among large cities, Los Angeles led both the U.S. and the world at 102 hours, although the list doesn’t include China. INRIX combines data from in-car navigation systems, personal devices, taxis and truck fleets to generate its reports. Everett is too small for the major-city list, but while sifting through national results, the company found it had a 28 percent peak congestion rate, the highest in the country. That rate is the proportion of all driving between 7-9 a.m. and 4-6 p.m. that occurs in stop-and-go conditions — code red in online traffic maps. Congestion goes both north and south, which makes the scores twice as high as typical perimeter cities, said Graham Cookson, INRIX chief economist and lead author. Cross-state drives, Paine Field aerospace jobs, and the Tulalip retail-casino complex add to the Seattle-bound workforce. Marysville resident Karen Gunter endures it daily as a passenger — dropped off by her husband, Tim, at the South Everett park-and-ride, before he drives west to work at Paine Field. From the park-and-ride, Gunter travels another hour on a bus into Seattle. Traffic slows before 6 a.m. in the two-mile strip before the I-5 Ebey Slough overpass, from Marysville into Everett. “There’s always a bottleneck. It’s usually 5 or 10 minutes, but last week there was an accident and it took 20 minutes,” Gunter said. Her full trip to Seattle takes 80 minutes on average, but can reach two hours depending on traffic. Gunter said she’s tried transit all the way, but I-5 buses crawl through Everett’s Marine View Drive area, which lacks high-occupancy lanes. INRIX’s Cookson noted the viaducts, bridges and limited access in that stretch of freeway. “Everyone’s moving farther on. There’s miles of I-5 where there’s no interchanges and exits,” he said. The South Everett park-and-ride lot offers 399 spaces, in a median between north- and southbound lanes, that fill by 6:10 a.m. midweek and 6:30 a.m. Mondays and Fridays. Her employer, Northwest Administrators, will open a Mountlake Terrace office soon, so she won’t have to park-and-bus to downtown Seattle, then backtrack to an Eastlake office. Major freeway expansions in the Everett area aren’t planned anytime soon, but lawmakers are considering how to replace the narrow Highway 2 trestle near downtown Everett. Solo and carpooling drivers remain the vast majority — some 182,000 vehicles daily travel I-5 at South Everett, compared to 29,000 peak-time bus riders using the freeway from Everett and Lynnwood into Seattle or Bellevue. To exploit limited highway width, the state is resorting to part-time “hard shoulder” lanes. Highway 2 has one, though it was to be blocked Monday afternoon, while a crane snatched logs from the swollen Snohomish River. Another shoulder lane near Lynnwood helps afternoon drivers exit northbound I-405 to northbound I-5. More are planned on I-90 from Lake Sammamish to Eastgate in 2019, and on I-5 from Marine View Drive to the downtown Marysville exit by 2020. Sound Transit will spend $280,000 this year for construction so buses can drive the southbound left I-5 shoulder between Lynnwood and Mountlake Terrace. But light rail isn’t scheduled to reach Everett until 2035, or even Lynnwood until at least 2024. An 11.9 cent gas-tax increase passed in 2015 will fund widening next decade along I-5 south of SeaTac and along Joint Base Lewis-McChord, and Highways 167 and 509 from the Port of Tacoma to Auburn, plus new I-405 toll lanes between Bellevue and Renton. Meanwhile, Cookson suggests using technology to help avoid the worst of the congestion. Drivers should make more use of navigation to avoid crash and work zones, or reschedule trips, he said, while parking apps can help drivers go directly into an open space, rather than circle the block. Cookson recommends lowering demand through teleworking, to shift people away from filling roads to meet 9-to-5 shifts. INRIX is investing in autonomous vehicles. President Bryan Mistele predicts that even a 20 percent market share for AVs would begin to reduce crashes and delays. For now, lead-footed drivers could simply move to the opposite corner of the country; highways in Fort Myers, Florida, average 68 mph, even in late afternoon.